When production began on Boyhood, in 2002, Richard Linklater was known as an indie-director of cult-favourites Dazed and Confused and Before Sunrise. Today, one remains a staple of Sundance success stories and the other is the first part of a trilogy. Suffice to say, Boyhood is his most ambitious project to date. Documenting a boy, Mason (Ellar Coltrane), turning into a man could’ve been cliché and obvious. Instead, Linklater manages to capture the honest glances and gazes of characters. Sibling rivalry is flippant and fun. Friendships and romances are passing and innocent. This isn’t “12 Years a troubled-teen” – this is the conversations, and memory-keeper moments, that matter. Gazing out of the car window as your father (Ethan Hawke) amusingly explains how you should converse. The step-father who drank too much. The mother (Patricia Arquette) who never gave up. Like life, nothing stays the same. Mason can be sulky and this can irritate, but look past his story and consider his perspective. Young and impressionable. Artistic and expressive in his fashion and photography. Like Mason, who constantly soaks up the world, Boyhood wants you to take away more than entertainment. Richard Linklater knew he had gold as, little over three hours long, one could argue the length is a problem. But, in this binge-watching age, a 12-part series in three-hours is surely no chore. And it isn’t. It’s playful and joyful. 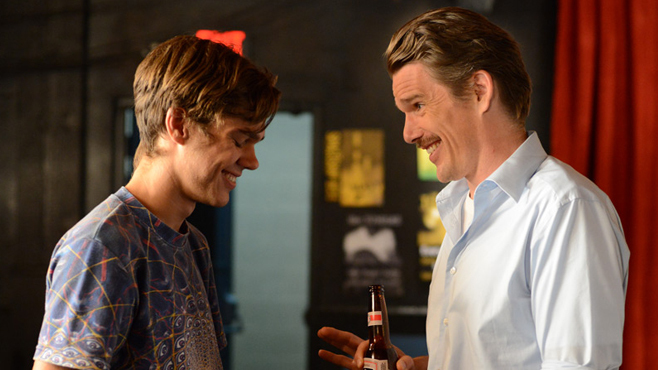 Boyhood celebrates youth and comments on politics and parenthood, passing little judgment. Without saying much, Boyhood, moodily, says it all.